Learn how to use the media library to upload, manage, store, and use images for your messages. Listrak's media library makes it easy for email marketers to store, manage, and insert files into email campaigns while eliminating technical difficulties and dependency on in-house IT departments. Image files including .jpg, .gif, and .png can be used within your HTML messages while other file types, such as .pdf documents, can be linked to within the message. The media library includes 25 MB of storage space and 3 GB of data transfer. The current disk usage can be seen in the top left-hand side of the media library. NOTE: Additional storage space may be purchased by contacting support@listrak.com. Additionally, you can access the media library directly from the WYSIWYG editor using the Media Library icon. The media library tree view allows the creation of new folders to help you organize the files. To open a folder, click the Expand icon next to the folder name. To close a folder, click the Collapse icon next to the folder name. NOTE: Moving, renaming, or deleting files or folders could affect messages that have already been sent. Moving, renaming, or deleting a file or folder will also change the URL path and break any existing links to the file location. When image files are selected in the tree view, a preview of the image is displayed in the main window. This image is resized to fit the display area but you can click the image to zoom to full resolution. Other file types will show an icon representing the selected file type. 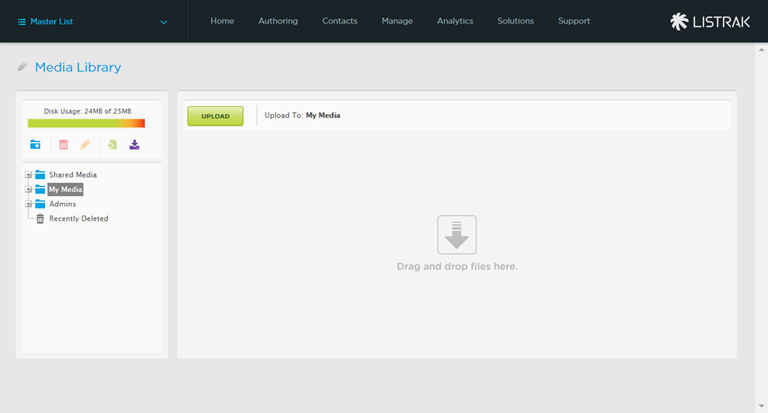 The media URL area will display the URL to access the selected file. This can be used to insert the image into your HTML code or link to the file. If you access the media library from the WYSIWYG editor, you can easily insert the image or file link into your content without copying the URL. All file types will show the file size and the date the file was uploaded to the media library. Image files will also show the width and height dimensions of the selected image. Shared Media: This folder is used to share media files with everyone on your Listrak account. My Media: This folder access is limited to just you. Other users with account access (and different admin names) will not be able to access your images. Recently Deleted: Deleted files will live in this folder for 30 days after deletion. Deleted files do not count against storage requirements. Admin: This folder will only appear for admins (not to be confused with users). As the admin of the account, you'll have access to other users' My Media folders that will appear within the admin folder. TIP: You can easily restore deleted files by clicking on the image and then clicking Restore. To create a new folder, click to highlight the folder you want to nest the new folder under. Click the Add Folder icon or right-click on the existing folder. 1. To upload a file, click to highlight the folder you want to add your image(s) to. 2. 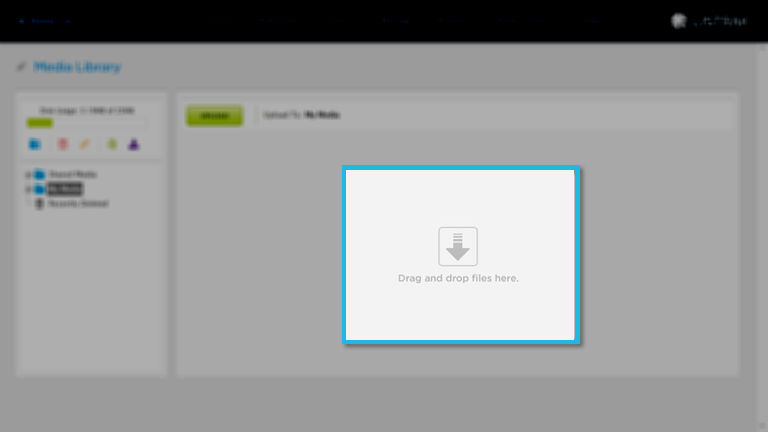 If your browser fully supports HTML 5 (Chrome/Firefox/Safari), you can drag and drop files into the drop area when a folder is selected. 3. If you are using Internet Explorer or an older browser, click Upload File icon at the top of the media library and click Upload. NOTE: Internet Explorer 11 is the only version that will support the drag and drop feature. 4. Your file browser window will open. Navigate to the image or media on your computer you'd like to upload. 5. Select the file(s) to be imported. TIP: Hold Ctrl on your keyboard to select multiple files to upload. However, if Silverlight or Flash is not installed, you will only be able to select a single file at a time. NOTE: If you by chance reach your disk usage limit, you will be unable to upload further files without deleting existing files or contacting Listrak Support at support@listrak.com to increase your media storage limit. 6. Click Open in your file browser. Each file selected will show a progress bar as it is uploaded to Listrak. Once your files have completed the transfer, the screen will refresh and the new media will be available in the correct folder. To delete a folder or a single item, click on that item. To delete multiple files, hold Ctrl on your keyboard and click each file to highlight them. Click on the Delete Item icon at the top of the media library, or right click on a selected file and click Delete. A confirmation pop-up window will appear. Click Yes to delete the item. Deleted items will remain in the Recently Deleted bin for 30 days. To restore a deleted item, simply click on the Recently Deleted icon. Then click on the image file you want to restore. To rename media or folders in the media library, click the item you'd like to rename. Click the Rename icon at the top of the media library or right click on the file or folder and select Rename from the menu. Enter a new name and click Ok.
Click the Export Folder icon at the top of the media library or right click the folder you'd like to export. Select recipients by selecting users that you have previously created using User Manager. To add media from the media library to a message, navigate from the home menu to Authoring. 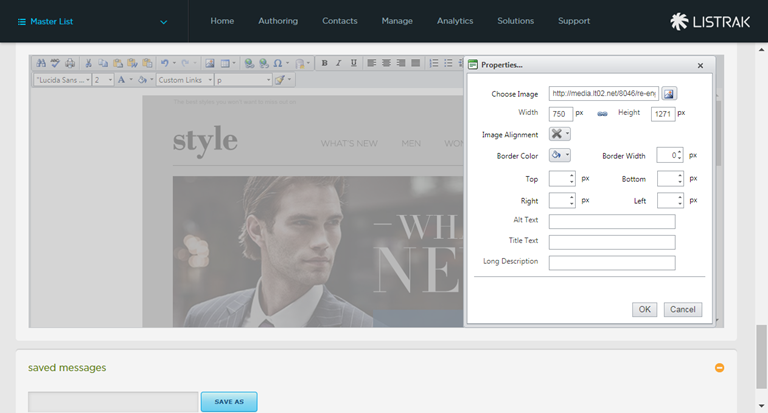 In the WYSIWYG editor, place your cursor in the creative where you want to insert the image or link. Click the Media Library icon. The media library will open in the WYSIWYG. Click to select the item you would like to insert. Click the Embed icon. Images will be entered into the HTML creative. Other file types will be entered as the file name text linked to the file. Once an image is embedded in the message, right click the image to access the Image Properties. Choose Image: Replace the image if needed. Width and Height: Determine a custom height and width for your image. NOTE: The Link icon maintains the aspect ration. Click it to select or deselect lock aspect ratio. Image Alignment: Determine the alignment of the image within the space. Border Width: Select an image border width. Border Color: Select an image border color. NOTE: You must set at least 1 pixel for your border to appear. Top/Bottom/Left/Right: Define margins around the content. Alt Text: This text will appear when images are turned off, not yet displayed, or if the image no longer exists. Title Text: This text will display when you mouse over the image. Long Description: This text appears in the "longdesc" property on the <img tag>.